Sean Carr believes that guards exceeded their commission during the incident at Langeron beach in Odessa, and asks not to politicize the incident. S.Carr said in his comment to UNIAN news agency that he was in Odessa with his wife Yevhenia Karr [daughter of Prime Minister of Ukraine Yulia Tymoshenko] during June 19-21. They lived in Nemo hotel at the territory of Langeron city beach, he said. 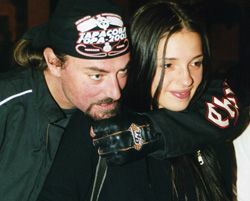 According to him, in the evening of June 20, he and his wife, together with their friends bikers, were returning by motorcycles from the city to the hotel. The friends drove to the beach territory through an arch without any problems, while S.Carr, as his motorcycle was too big for such a maneuver, drove to the roadway gate, and asked guards to let them in, having explained that they lived in that hotel. He said he did not have any doubts about adequacy of his actions, because, first of all, a bus was driving through the gate at that moment, and, secondly, earlier he used to drive to the hotel passing by the gate without any problems. Besides, there were no signs restricting the movement, S.Carr said. According to him, guards, without explaining anything, roughly refused to lift the bar, were talking aggressively and in an insulting tone. After Yevhenia Tymoshenko rebuked them for their rudeness, one of them approached the motorcycle, threw Yevhenia to the ground, and pinioned her arms behind her back. According to S.Carr, under these circumstances, he had to defend his wife. After that, the guards attacked him and put handcuffs on him. According to him, some time later the handcuffs were removed, but they together with Yevhenia went to police on their own initiative, to submit applications about the incident. Considering the above-mentioned facts, S.Carr stressed that guards at Langeron public beach exceeded their commission, and asked not to politicize the incident. As UNIAN reported earlier, the Interior Ministry of Ukraine refutes inadequate information, disseminated by some mass media on June 21, that as if Sean Karr, son-in-law of Prime Minister of Ukraine Yulia Tymoshenko, beat policemen in Odessa. According to the Interior Ministry’s statement, forwarded to UNIAN, this information is inadequate and is politically motivated. The statement reads that, according to results of a preliminary investigation into the incident, and basing on results of forensic expertises, it appeared that guards exceeded their authorities, and, by brute force, inflicted bodily injures upon Sean Karr and Yevhenia Tymoshenko [Yulia Tymoshenko’s daughter]. The unprofessional actions of the guards caused a big public resonance and politicized the event.